As a kid when we all backed up as a family of Pandemians for a weekend of camping, my favorite utensil was the Spork when eating everything from camp port and beans to the weekend catch of fried bluegill. As a kid the Spork represented everything perfect in an eating utensil. It was a simple singular instrument of eating that was easy to clean and provided all manner of food service movement from dishware and plate to the mouth and could even cut things with the side if you sharpened it a little on a rock. Such an efficient instrument of eating was the Spork that I begged my mother to use it every day, but alas Mother Pandemic only allowed the Spork during camping. Recently while cruising my favorite outdoor sports store, I spied the new and improved Sporks from Light My Fire in both polycarbonate/Lexan and the super cool titanium. I left happy as an six year old with a four-pack of the synthetic Sporks and the Titanium version. The Light My Fire Sporks are way cooler and much more useful than my old spoon with tines. The purpose built spoon on one end actually allows the consumption of an atypical survival soup vs acting as a miniature stainer. The forked end functions like a true fork and even has serrations on the side to cut up your leathery camp meat, canned spam or fresh caught wild dill and cedar smoked salmon. I hesitate to refer to the regular Spork as plastic because it is made of either standard polycarbonate or a product similar to polycarbonate made by Eastman called Tritan that is BPA free. But the plastic Light My Fire Spork is heat resistant, Teflon cookware/serve-ware friendly, dishwasher safe, and nearly un-breakable. For the survivalist, hiker or outdoorsman the 0.3oz, 9g is a no brainer to include in your pack to prevent primitive cannibalistic hand based eating. The 4-pack is a inexpensive option for all manner of portable eating. Personally this is what I have started using one at work for lunch and also carrying one to picnics and paper plated summer dinner parties because I am typically left swearing at the cheapo plasticware that constantly breaks. 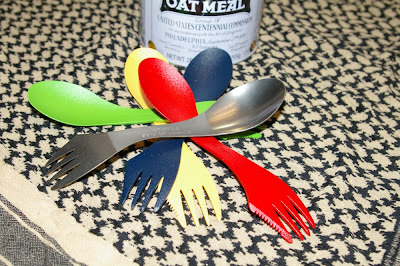 After writing this article and doing a little more surfing on the LifeMyFire.com site I found out they even have a SporkCase... which could make one of the handiest eating utensils cleaner before and after feeding. They even have the Spork now in various sizes from child to serving size. I should add that the spork greatly improves survival hygiene by preventing caveman eat-with-hand feeding, because you know you are doing "a variety of hygiene and dirty" tasks and probably do not have soap and water. The Spork was a favorite back as a kid and today with the design and materials update, it is a relevant and handy must have product today for the office worker, outdoorsman, and survivalist. Highly recommended.